In the entire Amazonian region, this is the only museum of its kind. Housed inside an old Jesuit building, The Church and St. Alexander College, this collection of about 400 items, relics, sacred paintings, sculptures, and silverware is now an indispensable part of Belem’s cultural heritage. The themes follow the relationships between the Church, Para’s past religious orders and the iconography of saints. Also check out the wooden image of San Francisco de Borja, which has a secret. The Church itself is worth a visit. The beautiful building was built in the 17th and 18th centuries. It has a notable sacristy prettily adorned with gold. Free guided tours of the churchfor whoever wants to know more about the church and the museum. Ask locals for public transport info. Drive, and ask for directions. Love this? Explore the entire list of places to visit in Belem before you plan your trip. Fancy a good night's sleep after a tiring day? Check out where to stay in Belem and book an accommodation of your choice. How popular is Para Religious Art Museum? 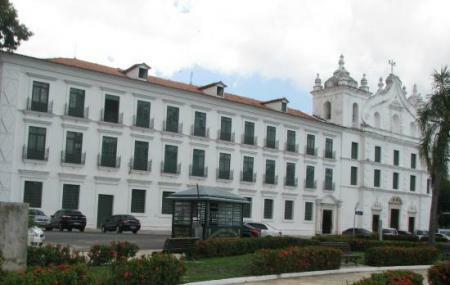 People normally club together Corvette Museum Solimoes and Espaco Cultural Casa Das Onze Janelas while planning their visit to Para Religious Art Museum. Amei conhecer a Igreja, linda, linda, linda. Voltei no tempo quando entrei nela, bem cuidada, equipe que trabalha lá super adequada, fico muito feliz em ver nossa história preservada, super recomendo de irem na Igreja Santo Alexandre. E ainda fica ali perto dos outros pontos turísticos, então é um passeio cheio pra quem gosta e quer conhecer mais sobre o nosso passado. Lindo! Podia estar mais bem cuidado e com o café funcionando. Ah, uma visita guiada cairia bem. De todo modo, lugar lindo com obras lindas! Vista do 2° andar sozinha já vale o passeio. Hj em dia um reduto da Cultura paraense, nela se encontra o museu da imagem e do som e é local certo para se passar bons momentos! Museu de arte sacra com ornamentação da época de sua fundação. Há exposições de artigos dos povos pré-cabralinos como o Muiraquitã e ferramentas antigas destes. Vale a pena a visita.